Reigning County Men’s champion Salter was imperious as he bagged five birdies in an opening 71, before carding three more birdies and an eagle two on the 12th hole in a second round 69. 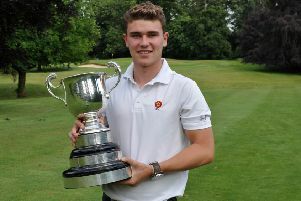 County club-mates Joseph Quinn and Harry Oddy finished seven and eight strokes adrift in second and third respectively. It was a lot closer in the girls competition as 13-year-old Critchley needed a play-off to beat Wellingborough’s Ellie Darnell, who was chasing a hat-trick of county victories after winning the 2017 Girls crown and the 2018 Ladies title. After the duo tied for first place on 155, Critchley carded gross pars on both the 18th and first holes to secure a play-off victory. Mark Stockdale won the boys’ net prize with a stunning score of 14-under-par, lifted the Irish Cup for his opening net 61 and was also part of the winning Scottish Cup team alongside fellow Overstone members Cameron Reeves, Jadon Pham and Baylie Pyke. Peterborough Milton members also collected a selection of prizes, including the Shoe & Leather Team award and the Girls Net trophy, which went to Shivani Karthikeyan. Joseph Quinn (Northants County) won the EG Boys County Championships Midlands qualifying event by one stroke at Ludlow GC with a 36-hole total of 135. 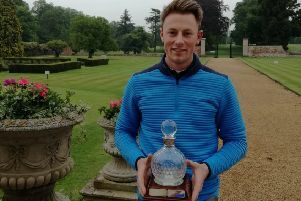 After shooting four birdies in an opening one-under-par 69 to sit four behind county team-mate Charlie Salter, the teenager found his scoring touch in the afternoon as he eagled the ninth, before carding three birdies and no bogeys over the back nine. Salter went on to finish in sixth place as the Northamptonshire team, who led at the half way stage, had to settle for second position behind champions Lincolnshire. Paul Askew’s putter was on fire whilst competing alongside son Liam in the Family Foursomes as they took the plaudits with a tally of 39 points at Silverstone. The Cold Ashby pairing carded five net birdies and a gross birdie on the 18th to finish two ahead of fast-finishing Barry Harding and Sam Harding (Staverton). Northamptonshire’s Seniors team recorded their first victory over Nottinghamshire with a commanding 13½-4½ success at Peterborough Milton. The side, which included five debutants, never looked back after winning four and halving one of the six foursomes matches in the morning as they inflicted just a second defeat on Notts in League history. Northants County’s policy of selecting the county’s leading young golfers for their 2018 Scratch League team paid immediate dividends with a devastating 7-1 win at defending champions Wellingborough. With Michael Farr and Rhys Taylor, who both won, the only players over the age of 20 in the away team, teenagers Joseph Quinn, Harry Oddy, Luis Witherall, Charlie Salter and Ben Jones all collected points. Kettering made a winning start to their second division promotion campaign as they recorded a 7-1 home victory against Rushden. Dave Harkess, Rob Stevenson, Marc Asher and Jamie Ashcroft all bagged points with three holes to spare, while Chris Ward, Andy Robinson and Dean McIntyre were also successful for the hosts. Rushden’s lone point came from Chris Adams. Home victories are proving difficult to obtain in Group A after Northants County and Northampton both avoided defeat on their travels. County, who won at Overstone the previous week, edged a thrilling contest at Rushden as Lee Ault and Andrew Chubb’s big victory helped the team triumph 10-9. Northampton remain top of the pile, however, on five points after they held on for an 8-8 draw at Overstone. Collingtree Park’s strong tail proved crucial in their home contest with Peterborough Milton as the reigning champions came through by the scoreline 14-7. Despite leading early on, Collingtree looked in trouble when the visitors went 7-5 ahead, but the hosts quickly regained control, thanks to David Messom and Sam Patel (five holes), and Mike Clarke and Tom Low (four holes). Kettering secured their second victory in two outings as they defeated Hellidon Lakes 17-3 at home. The hosts were rarely in any danger as club vice-captain Sean Suddards combined with Alun Genner to take the opening tie by six holes, before Toby Askew and James Noble romped to an eight-hole victory in game four. Experienced county professional Brian Mudge emphasised his fitness, stamina, talent and generosity in a unique 90/90 challenge on a humid wet evening at Overstone Park GC. Aiming to play 18 holes in under 90 minutes and within 90 shots using only one club, the 60-year-old carded a score of 86 as he completed the course with a seven iron in just one hour two minutes and 33 seconds. Mudge, who is one of the county junior coaches, raised about £1,200 for the Overstone Junior section in the process. Overstone Park are the team to overtake in the battle to grab a semi-final spot after completing their campaign with a 4-1 home victory against Northampton. Points from James Barker and Richard Dalton (4&3), Jamie Newton and David Smith (one hole), Jack Binch and James Gardner (3&2) and Phil Gardner and Pete Softley (2&1) secured a third victory in four outings. Staverton and Northants County, who meet in the last round of fixtures, are the teams who can pip Park. Staverton Park maintained their perfect record as they secured a fourth win out of four with a single-point success at Priors Hall. Denise Aitchison, Ann Cox, Janet Lambdon and Tracy Lane grabbed the all-important point for Staverton, while the home wins came from Maria Kealey, Rose West and Maryann Garioch. Oundle moved to the top of the Group B standings in style as they completed a 7-0 home whitewash of local rivals Peterborough Milton. In a match a lot closer than the final scoreline suggested, Oundle came through thanks to wins from Pat Silburn, Pat Wilkinson, Gerry Robson, Karen Johnson, Liz Swan, Sheila Homer and Ann Ireland.